Tall Dads Have Needs Too! If you're among the tall dads above 6'1", you're in the 90th percentile. 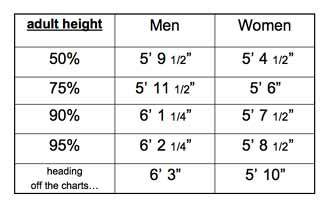 This means your height may likely produce a tall baby, if the big day of delivery hasn't happened yet and you're not sure. Most expectant dads of nearly any height, begin their journey a little concerned about strollers and stroller height, and for good reason. The average "umbrella stroller" (that's the lightweight, less-expensive, typical kind), are designed for the average woman, at 5' 4". On the days you're pushing it, the stoop over can be back-breaking. Worse, the wheels in front of you may be only 8 inches apart and the same distance from the handles - so you're kicking the stroller or wheels with every step. Not good. You only have to be about 5'8" before these strollers become maddening. But there is hope! There are some stroller options that work well for taller people. For the cheapest tall stroller, the EZ Umbrella Stroller is a lightweight "umbrella" stroller for a baby up to 30 pounds. It's not a travel system, so you'll need other items including a car seat, but if a cheap and light stroller is job 1, consider this at about $30 plus $14 shipping from tallparents.com. In a bit of a higher price range, the Baby Jogger City Series, has very tall handles, a wide wheel base (no kicking it), and holds up to 75 lbs. The Baby Jogger City Series (works for jogging or strolling), is around $375-400. This stroller can be a fantastic overall solution. It's truly among the tallest you can buy. But even though it's a jog stroller, it's small enough to use as a regular one. We found it collapses with one hand very easily too. It's got a very clever center pull that brings it all together for putting in your car trunk or storage, SUPER easily. So, if you're ready to reach up in price a tad, the Baby Jogger City Classic Single Stroller - Red/Silver is a fantastic option. We even found a review by a 6'10" guy's wife, who said it's great. NOTE: This is the Baby Jogger CITY stroller. NOT the City "Mini" model. The City "Mini" models are short! Keep it to the City Deluxe or regular. No "City Mini". At the very top of the tall stroller scale is the highest price "tall" version, the Teutonia brand 300 series. These are REALLY tall strollers. Handles are up to 46"! It has great stride room. You can buy them with a variety of configurations (car seat compatible, or regular stroller). Or you can buy just the individual pieces. This option totals around $450 as base, seat and an option or two, then up to $700. The trouble is, this stroller is really hard to find. The manufacturer Tuetonia doesn't ship it, but you may be able to find a nearby retailer on their website. For our money, the Chicco was the way to go, for comfort and price. Then at a higher price range, (and inclusive of jogging capability), the Baby Jogger City Series. Of course, there's always the super high-end pram stroller, but it's so unique, it's not for everyone. Lastly, on the 'high end" you may have heard of the Bugaboo (a common celebrity brand). Only the Chameleon model is "tall" and it's around $900. The wheel base is still kickable with a long stride, however so we recommend one of the other solutions. Also on the expensive but not-tall enough-to-be-worth-it category: the Orbit system. It's really expensive, and they only sell the components as "packages". Again, around $899. And if you've already got the car seat, it doesn't matter - they will only sell you the base WITH a car seat. Silly, so not worth it. It's got about the same leg room as the $140 Chicco. It just "looks" cool. Tall dads are also concerned mostly with glider chairs and changing tables. They need to fit in the chair, and not stoop over the table. So check these pages too. You're already losing enough sleep with your brand new bundle of joy. There's no reason that just because you're tall, you should have a back-ache too. Peruse the rest of our pages for other tall baby solutions, and we hope you find products that really fit on your tall parent journey!